In the same country, the spectacle of a total solar eclipse of the Sun is rare. Thus, at a given location, several centuries may elapse between two meetings of the Moon and the Sun. Before the 2081 September 3 total solar eclipse, the 1999 August 11 one, showed us how popular, original and unforgettable this event is. On 2090 September 23rd, northern France will be again under the moon’s shadow for another total solar eclipse at sunset. Unfortunately I won’t likely see them from my home! The archives of the past give us pretty poor evidence. During the last millennium, the 968 December 22 total solar eclipse that crossed France from the northwest to the southeast was the first one mentioned. Here is what was said of the 1033 June 29 annular: "It was extremely awful. Indeed, the Sun took a sapphire color, showing only its upper part that looked like a 4-day old moon crescent", at Cluny where the eclipse was a 99.4% partial. The one on 1239 June 3 is depicted in Montpellier where the King Jean the Conqueror just arived: "The day was so dark that we could see stars in the sky." On 1333 May 14, Johannes de Muris observed an eclipse in Evreux, along with three other friars of his congregation and in the presence of the Queen of Navarre. He noted that the phenomenon started 17 minutes earlier than planned by the astronomical Alfonsine tables. In the year 1406, a total solar eclipse plunges Paris into darkness. The remarkable "darkness" of the 1605 October 12 is brought up in Marseille. In the fifteenth century, the time difference between the predictions and observations can reach half an hour to an hour. 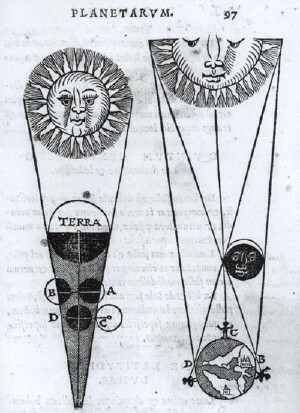 But a few years later, using revised tables of the Moon astronomers were able to predict eclipses to an accurracy of a few minutes, and La Hire indicated in 1706 a gap of only a minute and a half, reported four centuries later the abbot Moreux in his book Les éclipses. During the Renaissance, an eclipse is synonymous to terror for many people who see a warning sign of vengeance from the sky. The abbot Moreux wrote "the crowd invaded the churches and clergymen failed to confess everybody". Then a priest near Paris who could no longer handle the task had a fairly innovative idea. The previous evening, exhausted and unable to do more, he came out of the confessional, climbed the degrees of the pulpit and addressed the crowd: "My brothers, he said, because of the 'sudden rush of people, astronomers have decided to postponed the eclipse fortnight.' The chronic failed to tell us if the parishioners returned the day after the eclipse." Then in the next three centuries, nine total or annular solar eclipses have been recorded in France. Three in the eighteenth century: the totals of 1706 May 12 and 1724 May 22, and the annular of 1764 April 1st. Three others in the nineteenth century: an annular on 1820 September 7, a total on 1842 July 8 which lasted more than two minutes and hit Montpellier, Perpignan, Narbonne, Marseille and Toulon, and an annular on 1847 October 9. The three eclipses observed in the twentieth century are, the "pearled" 1912 April 17, the totals on 1961 February 15 and 1999 August 11. The most famous eclipse during the eighteenth century, was the one in Paris on 1724 May 22. On this occasion, the Academy of Sciences made major preparations. King Louis XV himself wanted to make experiments. He ordered astronomers Maraldi and Cassini to come to the Trianon Palace, and observed with them the progress of the moon shadow on the white board where twelve concentric circles had been drawn. He brought from his office a thermometer and a barometer to look for, following the expression of Cassini, "the temperature and air pressure variations that might happen during the eclipse." But the weather was not that great and much better observations were made at the Paris Observatory. The first total solar eclipse of the twentieth century that occurred in rural France has little in common with the more recent two as two world wars and a scientific and technological revolution changed permanently France. The eclipse of 1912 April 17 was visible from the southwest to northeast, around noon, on a line joining the Sables d’Olonne to Liège. To the west of Paris, in Saint-Germain-en-Laye, it was almost total: astronomers noted that it is "pearled". This means that the disappearance of the Sun between the lunar valleys and peaks is not complete so it displays a string of bright pearls. These glowing beads mark the irregular lunar limb profile and fragment the remaining crescent Sun. The front page of the daily newspaper Humanity that day, reports: "Eclipse on Earth and in the sky (10am to 1:08pm), before emphasizing the readers attention on the change of color of beings and objects during the two seconds of totality expected. "In grim light [...], faces will take a cadaverous hue, [...] the wind of the eclipse will rise." But the headline is obliterated by another terrible news that will have a broader impact through the century "A disaster that was thought impossible: the Titanic sank, swallowing up nearly 1,500 people." The countdown has started again. On 2081 September 3, around 8:36am, the Black Sun has another rendez-vous with France. This is page "1724 May 22" | Page "1912 April 17" | Page "1961 February 15" | Page "1999 August 11"
Starting page 262 in the 1724 Annals of the Royal Academy of Sciences, there is an observation report of the 1724 May 22 total solar eclipse, under the title The Total Eclipse of the Sun, done at Trianon 22 May 1724, in the presence of the King. The various events of this total solar eclipse are indicated by Cassini, to the nearest second, using a pendulum. The specified time is obviously the true solar time. The exact location and calibration of the pendulum are given: «Nous plaçames nos Instruments dans le Sallon qui est à l’extremité de la Terrasse du côté du Canal, & nous réglâmes la Pendule par des hauteurs observées avant & après midi.» The time accuracy is likely of a second since the height of the Sun was measured the same day and was a regular exercise for an astronomer. Contact times measured in true solar time (TST) need to be converted first in mean solar time (MST) using the equation of time (ET), and then in universal time (UT), knowing the observer’s longitude. The equation of time has to be recomputed for 1724 as it varies continuously. Around 18:30 its value, at the time of the eclipse, is equal to -229 seconds (ET = -3 min 49 sec). Those 229 seconds must then be subtracted from TST to obtain MST. 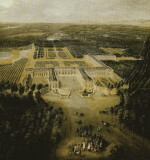 The Grand Trianon terrace position is 48.815389° latitude North and 2.104036° longitude East. To this longitude there is a -505 seconds, i.e. -8 min 25 sec, time difference with the Greenwich meridian. To get the universal time, the true solar time needs to be adjusted by -734 seconds, i.e. -12 min 14 sec. Les Oiseaux cesserent leur ramage, & disparurent quelques momens avant l’Eclipse totale, & le Roi vit très-distinctement Mercure, qui étoit à peu près au milieu entre le Soleil & Venus qui se trouvoient à peu près dans la même direction. On observa aussi diverses Etoiles fixes, telles que la Chevre, & on en auroit apperçû un plus grand nombre, si le Ciel n’avoit pas été autant chargé de vapeurs & de nuages qu’il l’étoit. On voyoit autour du Soleil une espece de couronne de lumière un peu allongée vers l’Occident, dont on ne pût pas déterminer les limites, à cause d’une brume épaisse dans laquelle se trouvoit alors le Soleil & la Lune. 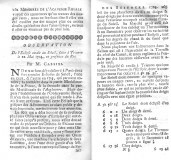 On fut aussi très-attentif à considerer si on ne voyoit point de rayons lumineux sur la surface de la Lune, de même qu’on en avoit remarqué dans celle de 1715 observée en Angleterre, mais on n’en apperçut aucun.» Jacques Cassini is obviously talking about the lack of prominences. With an estimated error of ±1 second for 2nd and 3rd contacts, the duration of totality is 136 seconds ± 2 seconds. Then I used my Five Millennium Canon of Solar Eclipses Database (5MCSE) tool to simulate the timings. It shows that using the regular ΔT value of 10.2 seconds there is an obvious time discrepancy. But with ΔT = 16.3 seconds the fit is quite good, the time measurement of 2nd contact being less accurate than 3rd contact because of psychological and visual difficulties related to the glare. The difference of a few dozens of seconds at 1st contact is not surprising for two main reasons: weather conditions were not very good («Le Soleil étoit couvert de quelques vapeurs ou nuages rares, au travers desquels sa lumière étoit, tantôt plus vive, tantôt plis foible, ce qui ne permettoit pas de distinguer sur la planchette la quantité des doigts éclipsés avec une égale précision.») And the detection of the 1st contact is always difficult. Detecting it after its occurrence is therefore perfectly logical. Last page update on April 10, 2007.